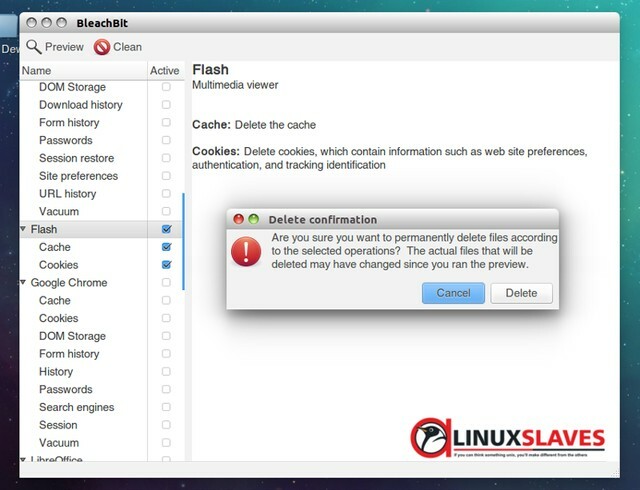 How to install BleachBit to clean up disk Space on Linux - When you are browsing the internet, installing and or uninstalling apps, it's possible that you leave traces everywhere on your system. And it may eat your disk space. For windows user there's so many application to clean junk files, cookies, cache, temporary files, remove logs likes CCleaner and TuneUp etc. How about Linux? There's BleachBit you can choose. Bleachbit is an open source application that can quickly frees disk space and tirelessly guards your privacy. Free cache, delete cookies, clear Internet history, shred temporary files, delete logs, and discard junk you didn't know was there. Designed for Linux and Windows systems, it wipes clean a thousand applications including Firefox, Internet Explorer, Adobe Flash, Google Chrome, Opera, Safari,and more. Now you can scan junk files, cookies, cache, temporary files, remove logs to clean up disk space running on your Linux desktop. That's all I can write about how to install BleachBit as alternate CCleaner to clean up disk space. Hope you've enjoyed reading this tutorial as much I’ve enjoyed writing it. Thanks for visiting us.